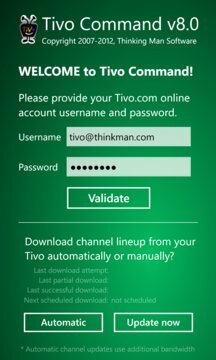 With Tivo Command you can control your network enabled TiVo directly from your WiFi connected Windows Phone. ● Similar to the physical TiVo remote, making the transition to Tivo Command easy and straight forward. ● Automatically finds all network enabled TiVo devices on your network, with option to enter IP addresses directly. ● WiFi control of all your TiVo devices doesn’t need line of sight, like old fashion IR-based remote controls do. ● Use voice commands for quick and easy access to your favorite channels, upcoming episode information, or to schedule new recordings. You can even find movie ratings on IMDB, Flixster, and Netflix by voice. ● Use your Windows Phone’s on-screen keyboard to enter text. No more scrolling thru the alphabet with left, right, up, and down. 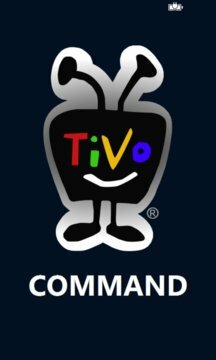 Tivo Command works with all TiVo DVRs that offer network based remote control access, such as TiVo Series 3, TiVo HD, and TiVo Premiere. To enable this feature on your TiVo, enable ‘Network Remote Control’ in Messages and settings > Settings > Remote, CableCARD, & Devices > Network Remote Control > Enable. Tivo® and the Tivo logo are registered Trademarks of Tivo Inc. and its subsidiaries worldwide.